Crunchy, chewy, sweet and packed with nutrients. 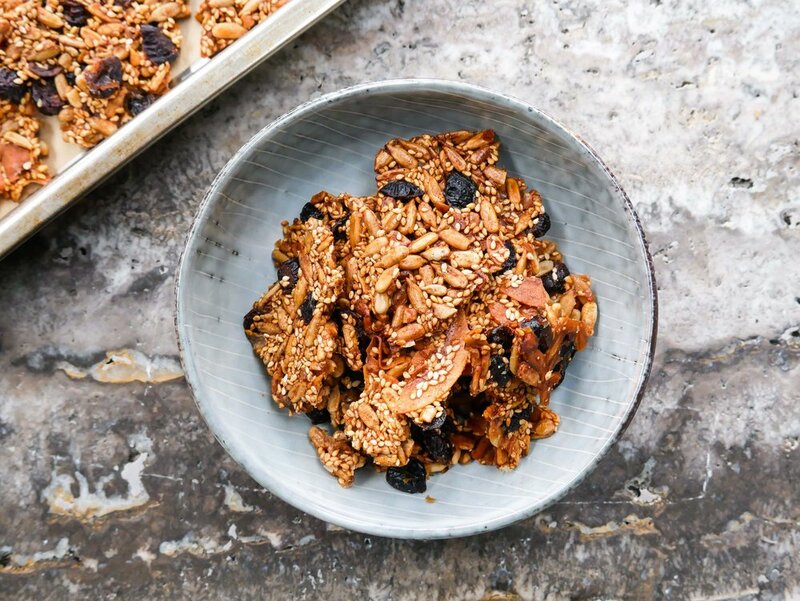 This easy-to-make seeded brittle gives you sustainable energy to stay fueled for the day ahead, and is a great pick me up. This recipe is nut free making it perfect for the kids lunch boxes. Feel free to add in chocolate, nuts or dried fruit. I’ve used the Kenwood food processor from Noel Leeming to chop the dried cranberries and sunflower seeds. The multi mill chops and grinds herbs, spices and nuts and the discs are ideal for grating cheese and slicing potato. Pre heat oven to 180 degrees fan bake. Line oven tray with baking paper. Using a food processor, pulse dried cranberries and sunflower seeds for 10 seconds. You don’t want them blended but broken into smaller pieces. This can also be done by cutting them by hand but I find doing this in a food processor or blender is easier. Place the sunflower seeds, shredded coconut, sesame seeds, cranberries and salt in a bowl and combine. Melt the coconut oil and brown rice syrup in a small pan over medium heat. Once this has melted, pour into the dry ingredients and mix ingredients together with the cinnamon. Scoop mixture onto lined baking tray and smooth out using a wooden spoon. Bake in the oven for 15 minutes or until golden. Wait to cool than break into pieces. Store in an airtight container in the pantry.